Speaking of Records, I’ve prepared a wonderous feast for your eye’s and ears, something like you’ve never heard before……..
It’s been a delight to spend time with you here and at your special places on WordPress. You inspire me with your many photos, projects, knowledge, gardens and stories about life. I wish for you a beautiful year, one for the records! Thanks for being a constant companion on my Blog Sheryl and all you kind messages. I sure appreciate your support. Happy New Year to you and yours! Look at you! Cute way to display the memories of one year. 🙂 Here’s to more Boomdee in 2014! Thank you so much, I feel blessed every day 😀 Time is going by so fast it seems. 2014 I want to savour, like a great slice of pie. Hope you’re able to savour all the little moments too, Happy New Year! Happy New Year from TheBigForest! Just catching up on the blog posts we missed whilst we were away! Fantastic, Welcome Home! Happy New Year to you as well and thank you for coming by. Best of love and life to you through out the year! Okay, so now I’m balling my eyes out! Ohmygosh ohmygosh ohmygosh!!!!! How did I not see this yesterday? You make me so happy! What a glorious time we had singing in the hotel lobby, oblivious to all around us. I wondered what became of our audio debut. Now you’ve made it even more special with your lovely video. I’m going to finish commenting, then I’ll listen again and again. Thank you for the gift of you. I’m the luckiest woman EVER! Surprise! xox, ((( you ))) sang your little heart out my sweet lark 😀 I knew the minute we did it, that I would save it for my final post of the year. I’ve wanted to email the mp3 so many times but then it wouldn’t have been a surprise. I’m so sorry to have made you cry hon. I think our voices are pretty well suited for duets actually. HA, I’m taking a page out of dear Pauline’s book and throwing modesty out the window today. Geez, wouldn’t it have been funny if I started to sing and I couldn’t keep in tune like some of the crazy additions you see on American Idol? Glad I managed, you have a lovely, strong, clear voice. It was a spontaneous moment of joy, captured for posterity and I have listened to it dozens of times. I had fun every moment of my visit and this is the icing on that delicious cake. But do let’s agree, we are (( both )) lucky, I must insist on this. 😀 xo Love and Hugs! You (((YOU))) I love that you saved it till now. What a memorable time. I agree…we harmonize really well. Much of the time, I couldn’t tell if it was you are me. Cool, eh? It was a spontaneous moment of joy and you sing beautifully, so please be kind to yourself. That was AWESOME!! And my favorite part? Hearing the two of you trying not to giggle! What a cool New Years blog post 🙂 and I’ll be singing “Boomdeeadda, Boomdeeadda” all night! Good to know! Thanks for the tips. Singing is so good for the soul. I love it! Agreed, It’s hard to have a bad time if you’re singing. Some of my favourite duets are from Opera’s. I’m certain you’ve heard this before…we’d need to learn it in french, it’s called the Flower Duet, performed first in Paris in the 1800’s…..flowers……Paris….remind you of anyone? Thank you Jen, Happy New Year to you and yours as we look forward to 2014. What FUN it’s been this past year – seeing all your wonderful projects, photos, sharing your trips…..you are such an inspiration to so many people with your creative heart! 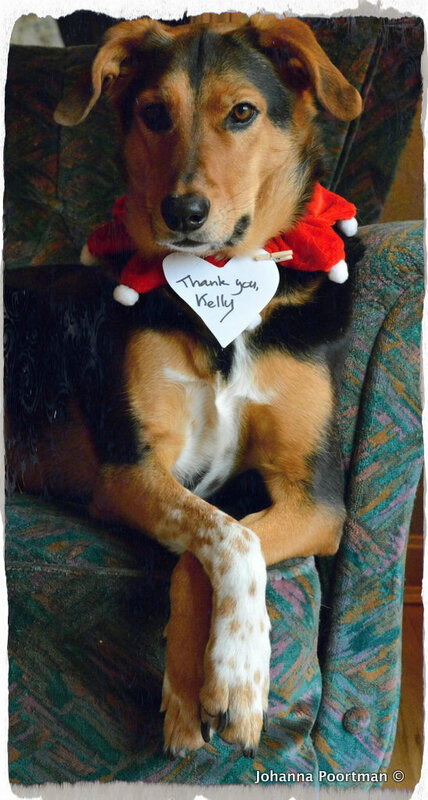 Sammy and I love you and here’s to a GREAT new year full of more fun…….and Sammy hugs! awwwww, thank you so much for being a big part of all the fun Pam and Sammy ! Enjoying what you do is so much more enjoyable with friends along for the trip. I can’t wait to collect all those Sammy hugs too. Coming right on over to the pawty! Bing Bong, Boomdee at the door, HA! Happy New Year to you too Boomdee! 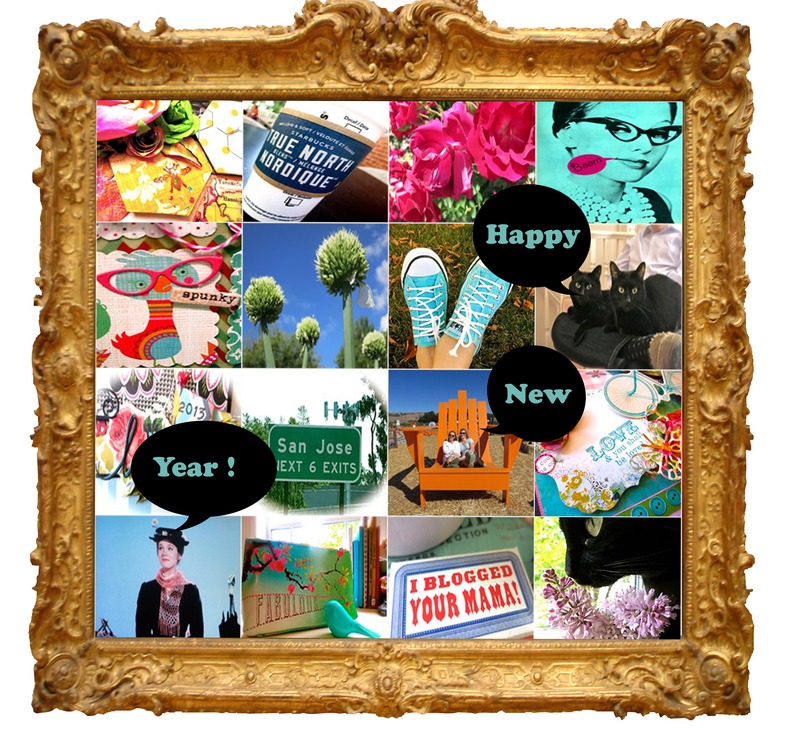 Thanks for all the beautiful and creative posts and wonderful stories this past year and here’s to many more in 2014. Many thanks for your beautiful message. I so enjoy following you too, around Europe with all your furry guests. Cheers and Happy New Year! Curses! I’m experiencing very frustrating “camping internet” here and cannot get your video happening – but I’m busting to see it so will keep trying! The very happiest and safest of New Years to you, Mr. B, Petals and Blossum, too, Boomdee! Enjoy your holiday! Can’t wait to see more Boomdeeadda in the New Year!!! LOVE IT! Love it! I have been so long away but I just knew I had to come to my “happy place” and spend a bit of New Year’s Eve with Kelly and Alys! Happy, Happy New Year ladies!! You are so funny my ribs are almost breaking from laughing. Right back at you girl. XOXO HUGS! Thank you ever so much. I hope you had a wonderful night of celebration! Did you host an evening? You’re a great party planner with your magic kitchen at ready 😀 Happy New Year !! I was busy trying to get words that were kind of in your lovely video and then my lovely new pc kept freezing and I got all discombobulated and ended up with that one…. Happy New Year, my dear Boomdee! La, la, la, meow, meow……All together now ! Thank you dear friends and the happiest new year celebrations to you! You more than likely already rang in, we 3 hr 15 min away.